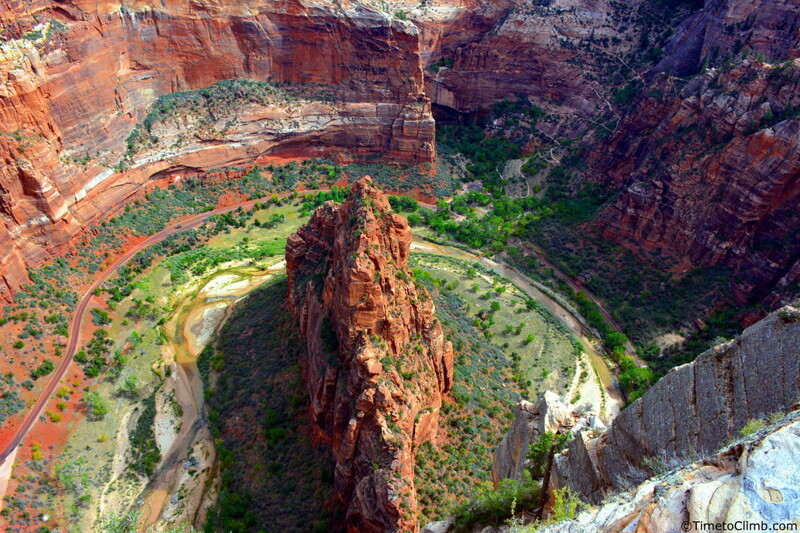 The crown jewel of Zion National Park is no easy location to reach. See why hiking Angel’s Landing is so difficult, breathtaking and rewarding to get to! Utah is quite a beautiful state! 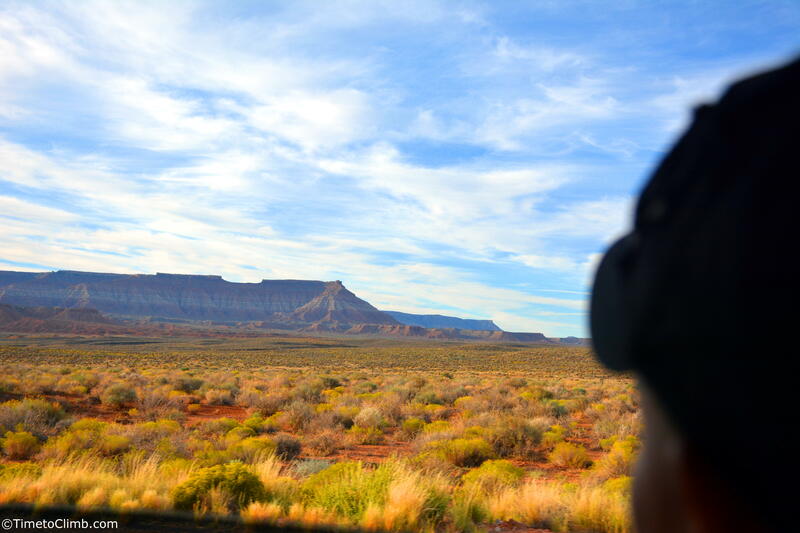 Even if you are just driving through, there are incredible sights in every direction. 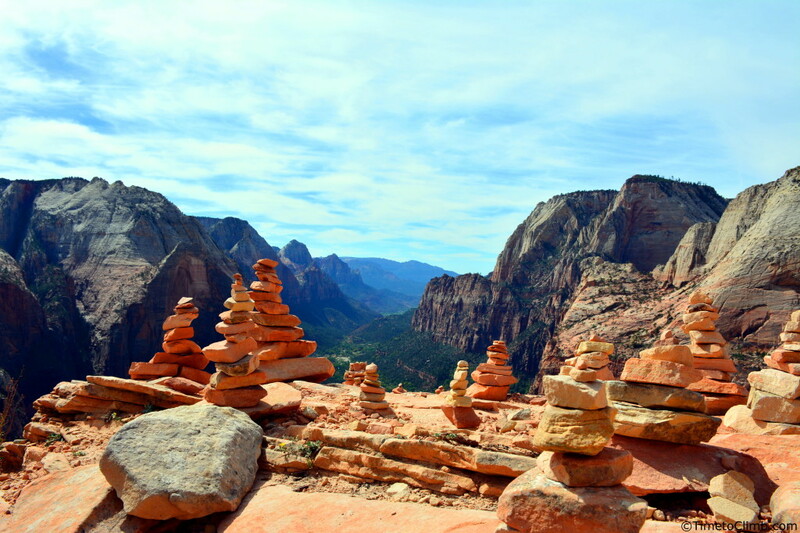 We could not help but take photos on our drive from Las Vegas out to Zion National Park. 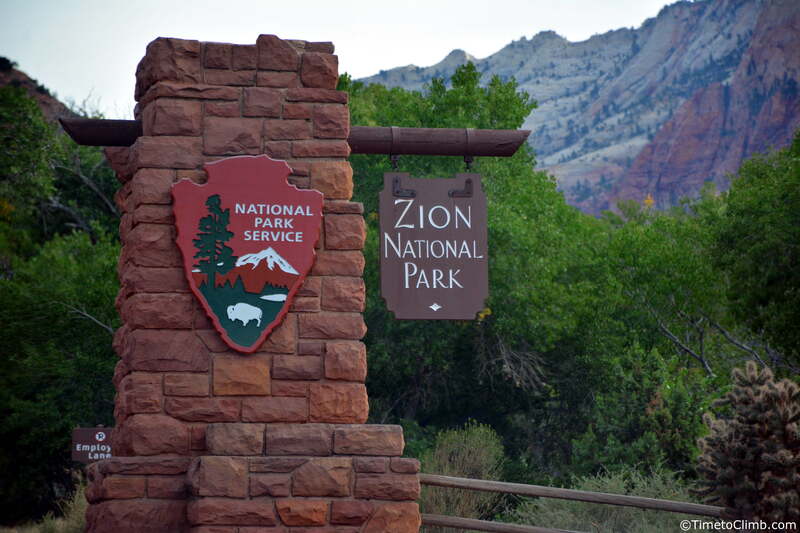 When you reach Zion National Park you will see this infamous sign greeting you at the gates as you enter into the of the park. 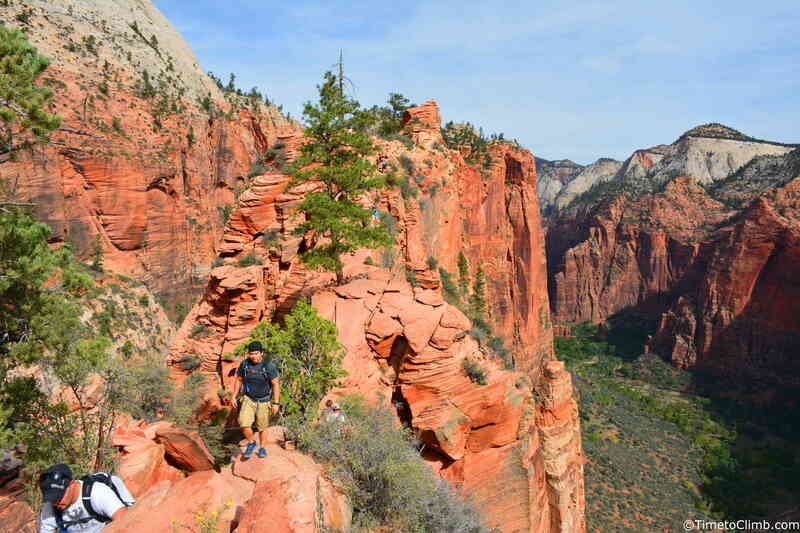 Once inside Zion you can not help but stare at the massive canyon walls surrounding you in each direction. 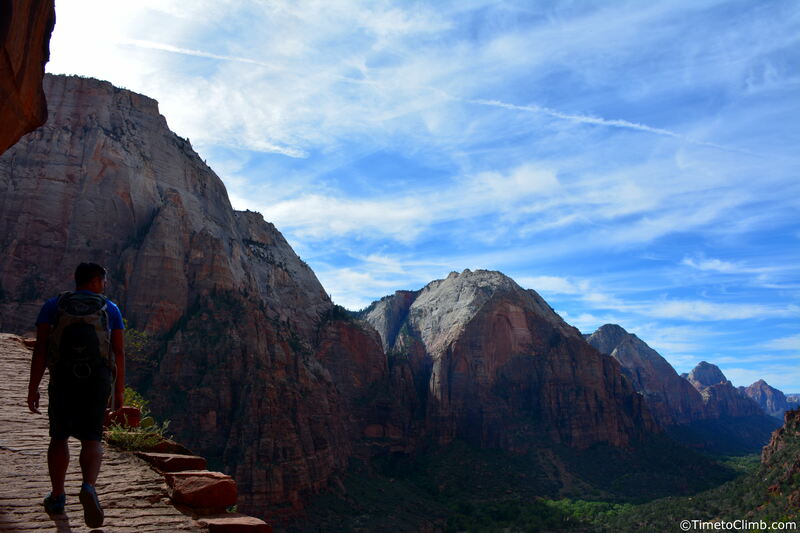 Many of these walls stand well over 2000+ feet tall! 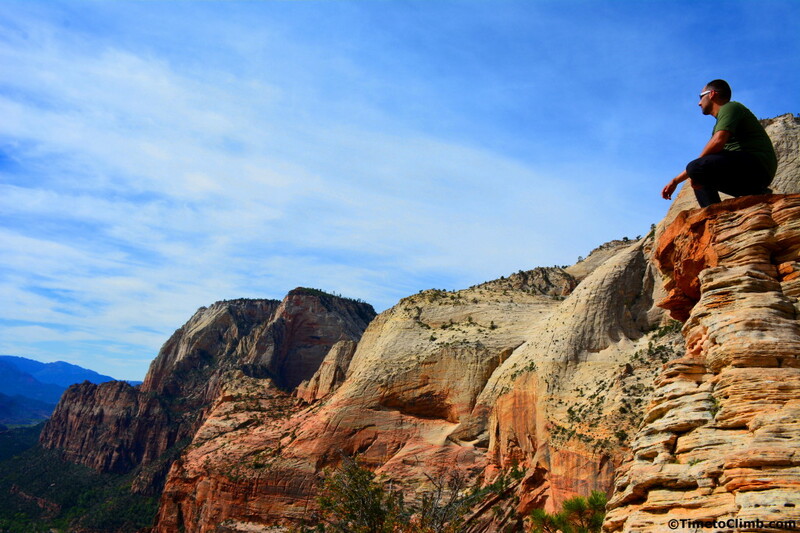 Welcome to feeling small and inspired simultaneously! 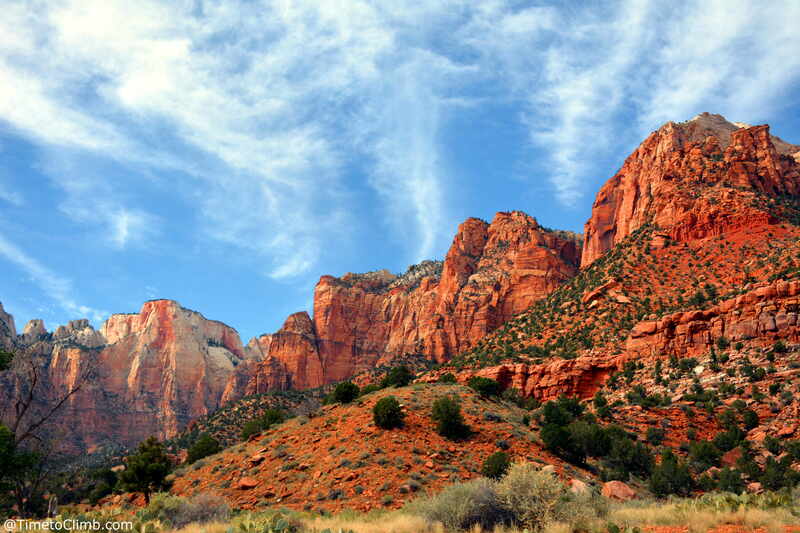 First stop you want to make after entering Zion National Park is the Visitor’s Center. This location will be your primary parking lot when you enter into the park each day. 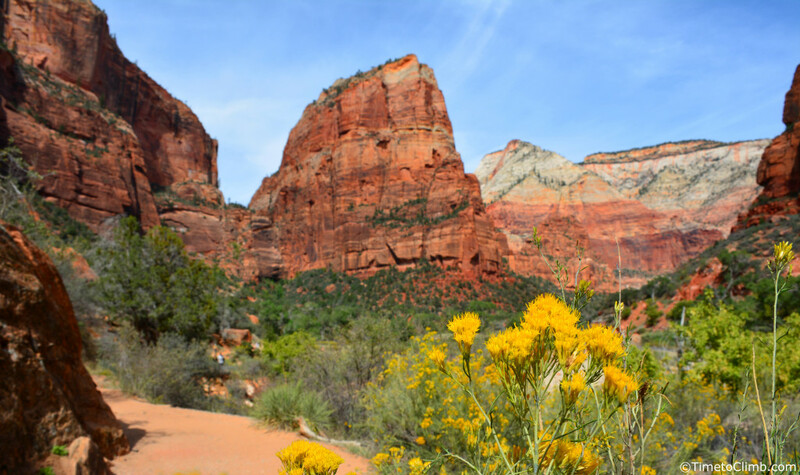 As a means to help reduce the amount of vehicle traffic inside the park they have shuttle buses that take you to the major trail heads and locations throughout the park. So park, take a walk into the visitor’s center and talk with the rangers at the information desk! These rangers are very helpful and will take the time with you to make sure you know where to go and best times to do each excursion inside the park! If you are hiking Angel’s Landing make sure to listen to them for the best times to go! 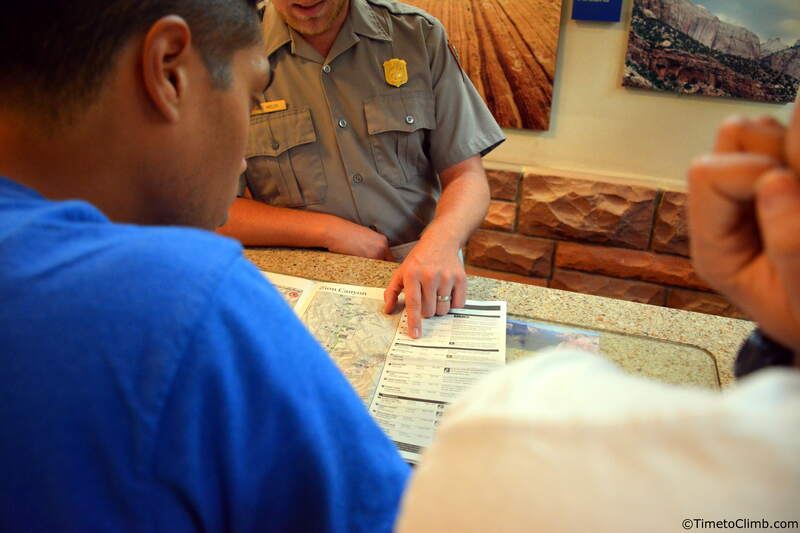 Grab a park map, take a few notes and plan out your travels within the park ahead of time! The first shuttle departs from the visitor’s center around 7am (Sept/Oct time frame). When hiking Angel’s Landing you want to catch the first or second shuttle out to the trail head. 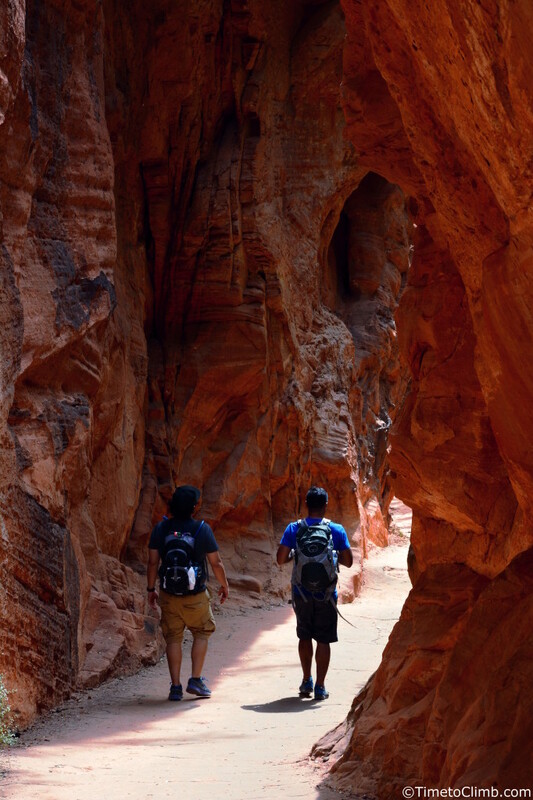 This hike very popular and grabbing first shuttle will help you avoid the crowds! After you make your initial hike along the river you will begin going up a series of switchbacks bringing you up above the valley floor. This first set is a fair amount of long switchbacks that won’t seem to end! 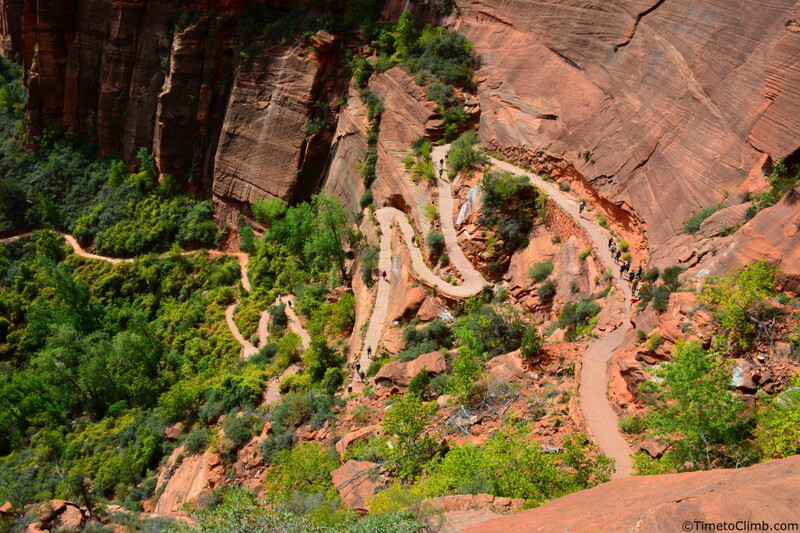 After you finish the first set of these switchbacks you will get a good perspective of how many you have actually done. 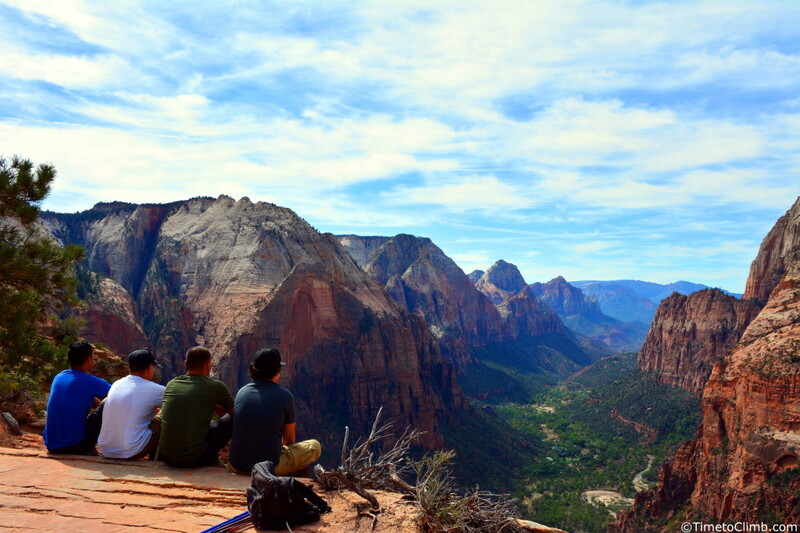 After catching your breath make sure to take a look out into the canyon! Your first reward of hiking Angel’s Landing is going to be this stunning view of the valley below. 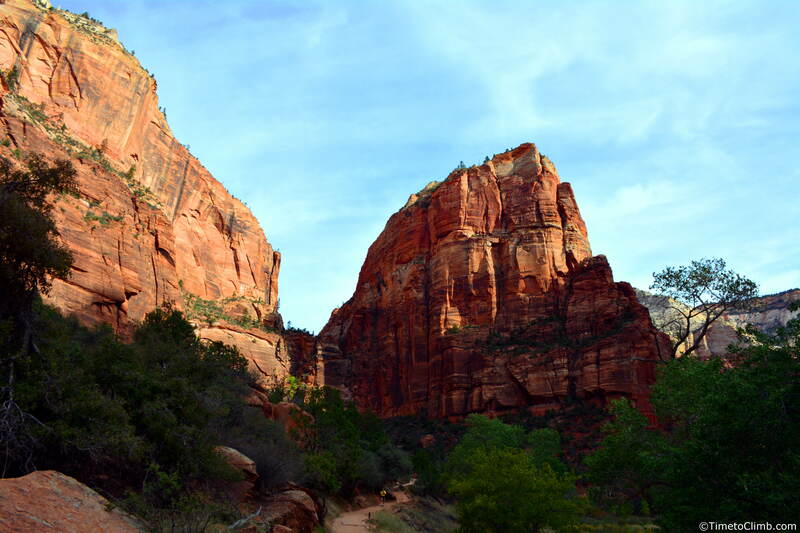 As you continue up the trail, it wraps back into the slot between Angel’s Landing and the adjacent mountainside. 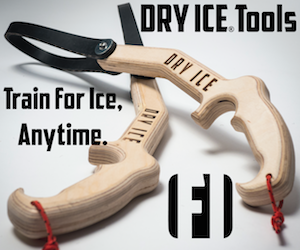 This will bring you up to the second series of switchbacks. Although this set may be shorter in length they are steeper and several more then the first group! 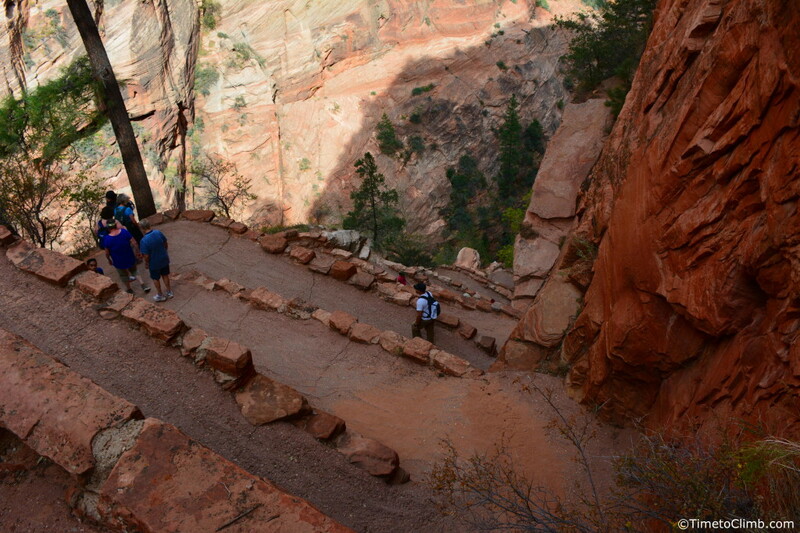 Make sure to have a good sip of water and catch your breath before starting this set of switchbacks! Congratulations! 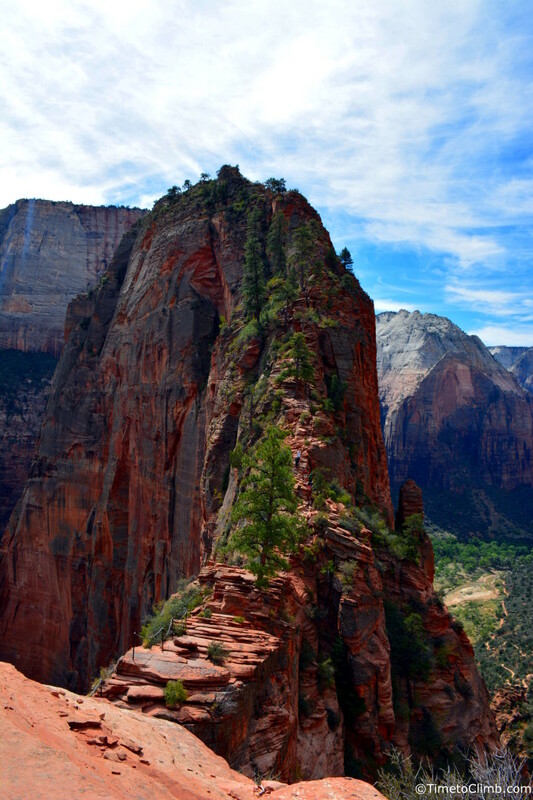 As you make your way to the top of the outcropping you are welcomed with this stunning view of Angel’s Landing ahead of you and finishing roughly 35 switchbacks in total to get here! Hold on to your britches as this is where the real fun begins! 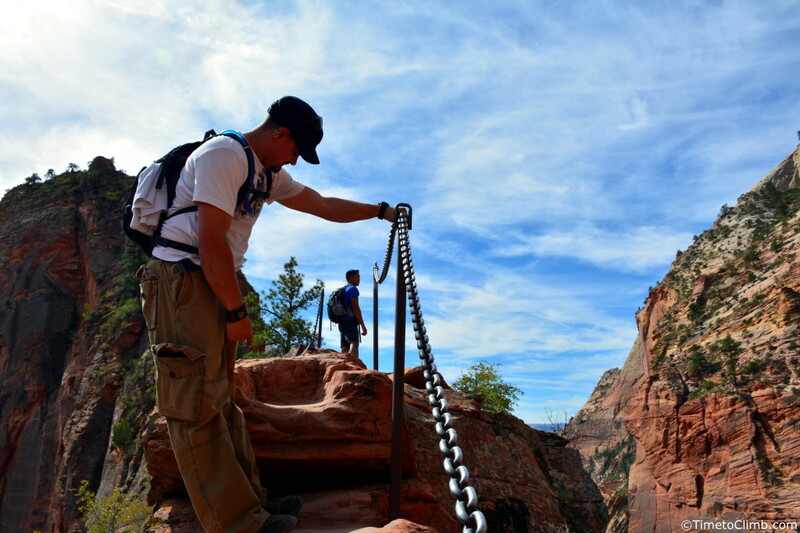 As you make your way hiking Angel’s Landing the trail becomes very narrow with steep drop offs on each side of you. If you decide to take a look on either side expect to have your heart skip a beat or two! With the help of the National Park Service chain railings were added to help assist with the crossing of this section. 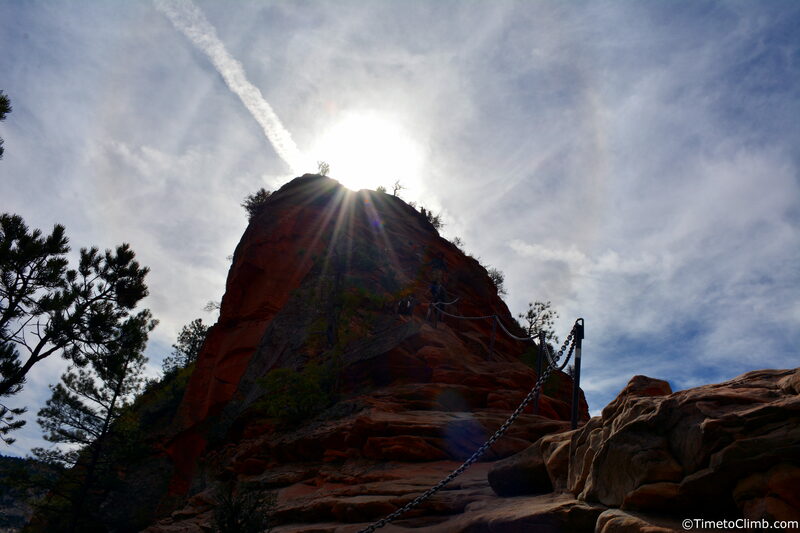 As you can see in the photo above the amount of foot traffic from those hiking Angel’s Landing has also taken its toll on the sandstone. 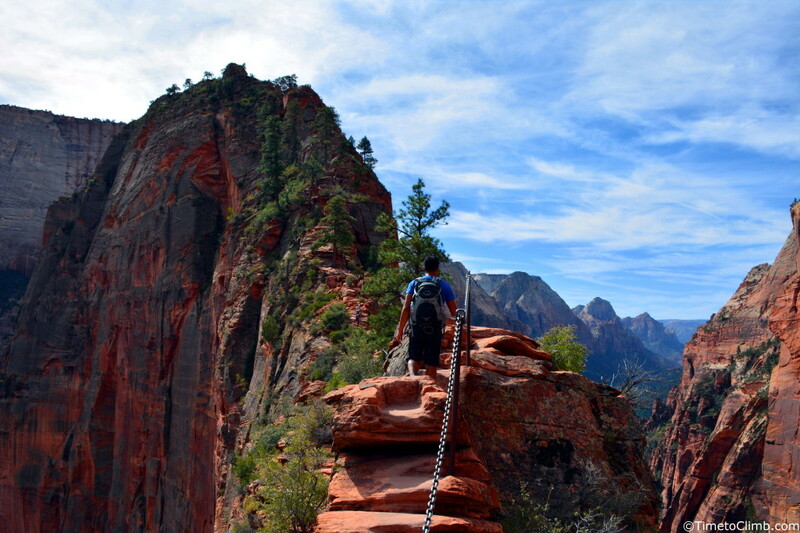 Due to the steepness and grade of the hike it is not hard to see where Angel’s Landing may have gotten it’s name. Bring your sunglasses you will be finding yourself looking into the sun as you make your way to the top! 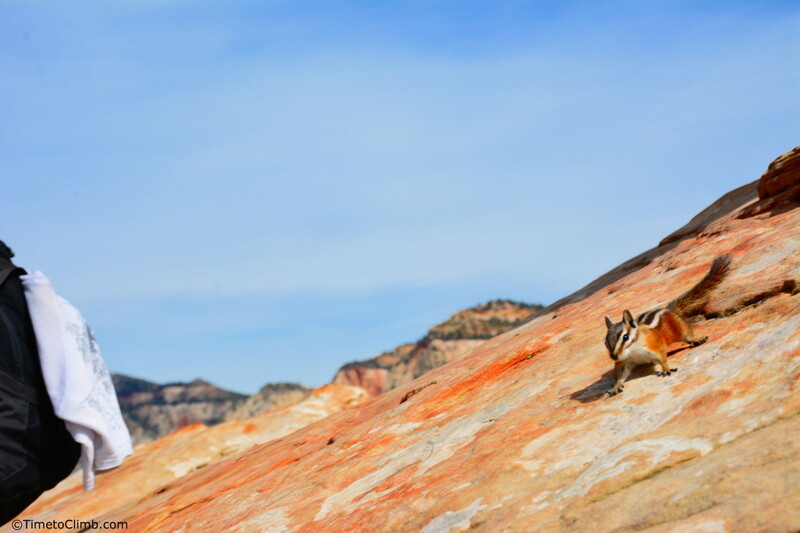 A cute little benefit to your journey is the large number of chipmunks which like to greet you at the top! Although adorable these little guys are masters at thievery! Do not leave your bags open or lunch unsupervised they will leap at the first sign of opportunity for a free snack! Note there is a $500 fine for anyone who is caught feeding the local wildlife including these little guys! 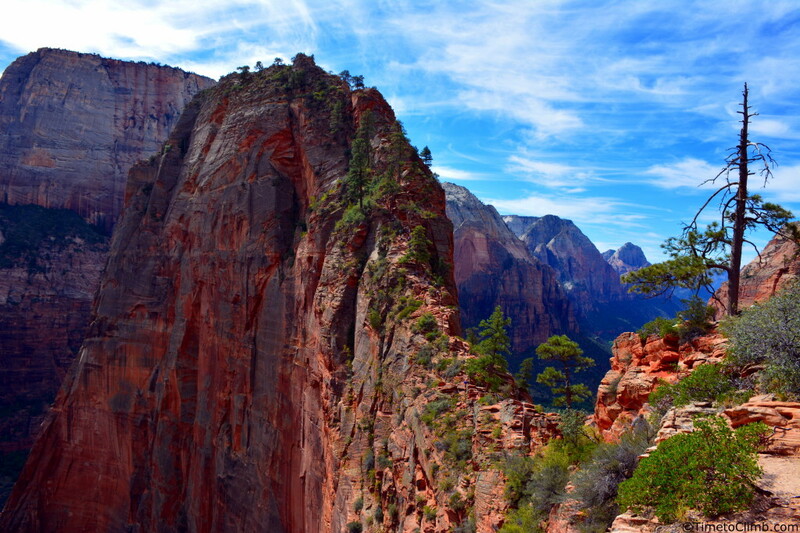 or on the valley floor looking up at Angel’s Landing in it’s entirety! 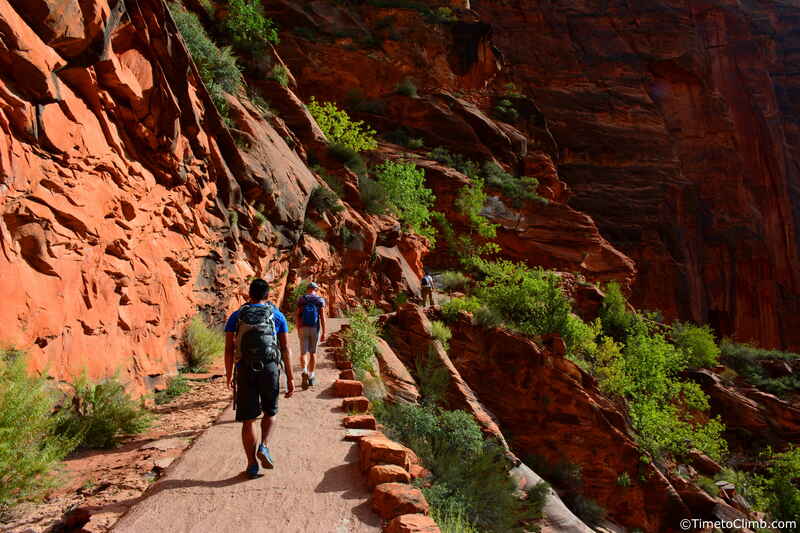 Make sure to check out these two links below when planning your trip to Zion National Park and for hiking Angel’s Landing!